The most direct way to and from Keswick is a train to Penrith (from London on a saturday, try the 9:30am Euston-Glasgow train) followed by the X4 or X5. The bus (at least, when I used it) leaves the station half an hour or so after the train gets in, but the castle ruins next to the station might entertain for a little while. From here to Keswick is down the main road, though, which is not bad scenery, but nor is it the greatest gateway to Keswick. Instead, consider the 8:30am train from Euston and change at Lancaster or Oxenholme for Windermere. 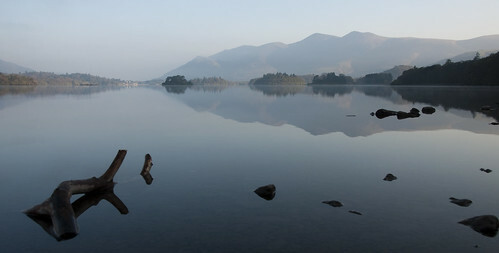 Seeing the more famous lake will allow you to appreciate the superiority of Derwent Water, which has escaped the plastic yachts, motorboats, and McMansions. Victorian NIMBYs like Wordsworth wanted to keep Windermere free from vulgarities, but for them vulgarities meant the working class masses, and so the railway that would have taken them to the lake sadly stops a mile or so from the shore, in the hope that this would discourage them from coming any closer. You could easily walk down the main street to the lake at Bowness for lunch, though. 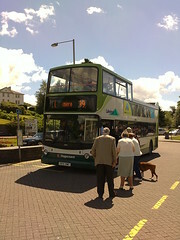 For Keswick you want the 555 from Windermere station. Alternatively, if you’ve walked to the lake, you could get a boat around to Ambleside — a much nicer corner of the lake — and pick the bus up there. I’ve never tried Windermere boats, so I don’t know where they fall on the public transport / tourist jaunt scale. Don’t be tempted to walk along the lake shore to pick up the bus at Ambleside: you’ll find it fenced off and covered in “private” signs, forcing you onto the main road (which does have a pavement but is not an exciting walk). Over the course of an hour the double-decker bus will give you a chance to see over the hedges and stone walls to watch Rydal Water, Grasmere, Helm Crag and Thirlmere leisurely pass. For the trip back? 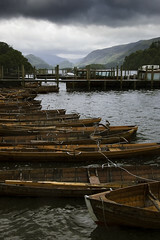 Ullswater, long and narrow in a deep cavern of mountains, is definitely worth a look. Take the 208 from Keswick to Patterdale, where you could take a steamer the length of the lake and pick up the 108 to Penrith station. For the hill-climbers it looks plausible that one could even take the 555 back to Thirlmere and cross the 950 metre Helvelyn to Ullswater, but I haven’t tried it. Catbells — you can take the boat (they’re not tacky tourist boats) across the lake to get to it, walk through the woods beside the lake for a little while, then up the hill and back down into the town. Or vice versa, of course. Distance: 5-6 miles; climb ~1000 ft above lake level. Latrigg — follow the course of the old railway up the valley, and then a reasonably gentle path up this little hill behind Keswick, for a nice view down the lake to the Jaws of Borrowdale and the mountains beyond. Distance: 6 miles; climb ~800 ft above lake level. Walla Crag and Castlerigg — walk along the lake or take the boat out to Ashness/Barrow Bay and walk up the picturesque Ashness Bridge, then up to Walla Cragg for a view up the lake over Keswick, Latrigg, and Skiddaw. Then over to the fantastic stone circle at Castlerigg — a million times better than Stonehenge, set in a great bowl of mountains. Distance: 5-6 miles; climb ~800 ft above lake level. If you want to put in a bit more effort, the 1500 ft climb of Haystacks is considered one of the best in the lakes. Haystacks is a few miles from Keswick but there are, of course, buses to its base on Buttermere. You can climb the mountain, have lunch beside the lovely little tarns, and then descend to stroll beside the lake to the ice cream shop in Buttermere village. 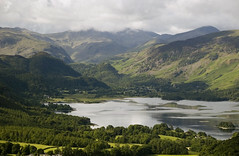 The bus journey itself follows Derwent Water and the river through Borrowdale, before climbing over the impressive Honister Pass. There are loads of other hills to climb and lakes to walk around — I’m not going to list them all, as there are plenty of guides. What matters is that you’ll have no problem getting to them by bus. This entry was posted in Uncategorized and tagged buses, car-free holidays, cumbria, holidays, keswick, lake district, the north west. Bookmark the permalink. Did you ever consider an alternative career as a travel agent?! Great tips, thanks for sharing. A lovely article, as always. I took a similar trip myself to the Lake District, without a car, 18 months ago. We did use two taxi journeys to get our luggage to and from our rural B&B – only served by bus in the summer – otherwise, it was all walking and public transport. We took the early Monday morning departure from Euston, travelling with Virgin. Their weekday First Class service was excellent and it was lovely to be treated to a good cooked breakfast whilst we whizzed through the Midlands. 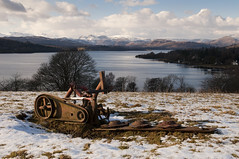 We changed at Oxenholme for Windermere before taking the 15 minute taxi journey from there. In spite of the changes, it was still quicker to travel this way. Needless to say, it was also more comfortable and relaxing. We spent much of the rest of the week walking everywhere: to Ambleside, up hills and to one of the two local pubs for dinner each night. Buses in the Lake District are generally pretty good, especially given its rural character. We once caught the bus from Windermere to Ambleside and back; it ran on time and the price was reasonable. The boats on Windermere fall more on the tourist jaunt scale, although they are perfectly usable to get around, running regularly and reliably. Some first class images in your posts.